#Leroy Neiman was a "celebrity" artist, meaning that he, himself, was a celebrity through most of his career. There aren't too many of them around, and now there is one less. design from #Clement Mok, and color from LeRoy Neiman. He painted sports and he did it boldly and passionately. 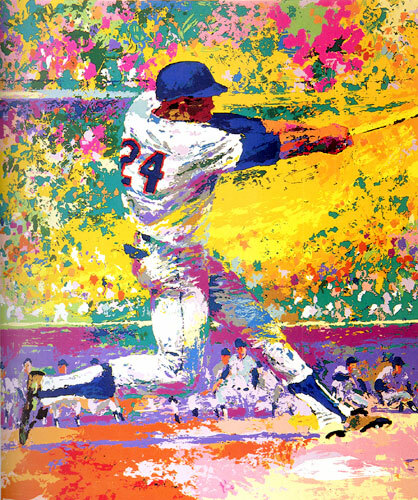 This is Willie as he finished his baseball career in New York as part of the Mets, which broke my heart as teenager ... he IS the San Francisco Giants to me. The yellow in this piece speaks of a mighty swing through the air and a powerful impact. LeRoy painted motion and you could feel it ... sometimes you could even hear it. This is in memory of another one of those giants on whose shoulders I stand. I never met you but feel like you have been my instructor for a long time.